While I was waiting for the wind to die down (which it still hasn't) so I could use basting spray to sandwich another recently completed UFO, I decided that I would tackle the feathered star project. A couple of days later and, voila!, the pieced top is done! The feathered star part of the block is 12" square; with the borders, it's 18". I've made a flanged pillow with it, putting a 12" pillow form in the feathered star block and having the poppy fabric as the flange. This state flower fabric has distinct bands of poppies in it .. it alternates between small scale and a larger scale flower. I used the small scale flower in the feathered star block and the larger scale as the outer border. The layout called for standard, butted edge borders, but I liked the look of mitered borders for this block, so that's what I did. I used a couple of different, non-traditional fabrics in the top, mainly cuz I knew it was going to be a pillow and, more importantly, they were the colors that I needed to use .. but most importantly ... I already had them in my stash! 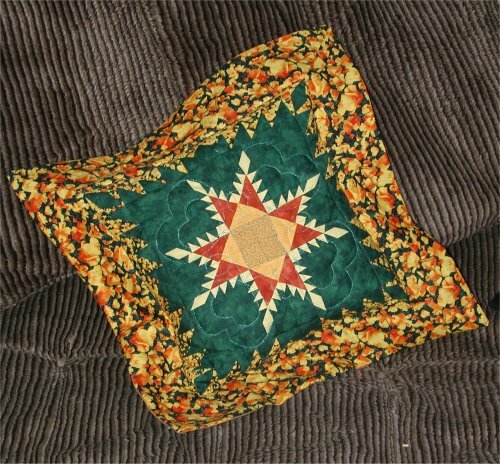 The poppy fabric, the brick-colored Moda marble triangles, the green Moda marble and the wheat-colored center squares are all standard quilting fabric. The bright yellow in the feathered part of the star is linen and the bright gold in the triangles bordering the central square is raw silk. It's backed with dark green homespun (no need to "waste" my precious Moda on the back of a pillow!). The quilting was concentric hearts in a metallic green thread. All in all, I'm pretty pleased with the way the pieced top came out, eventhough it was a tad more tedious to make than I anticipated.